I’ve sketched each of these over a recent photograph of myself, dressed for work. Hopefully, I’ve been accurate enough in my representation of the lines and shapes of each jacket to make at least an approximation of how each of these might look, made up. 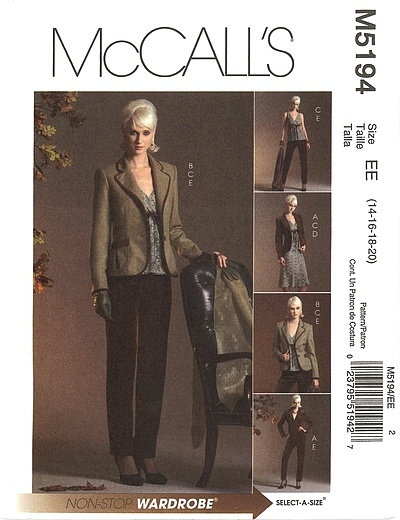 The first option is McCall’s M4930. It’s a basic, straight blazer but looks nice, layered over the lovely flared and furled skirt of the dress in the same pattern. Yeah, this looks about how all blazers look, when I try them on: like I’m dressed up for somebody else’s interview. Pity, though. I do really like the dress in this pattern, however, and I think I might put that on my list of things to make, soon. I think it’s the unswerving straight hemline at the bottom of the jacket that ruins it, dividing up my body along a level horizontal line. 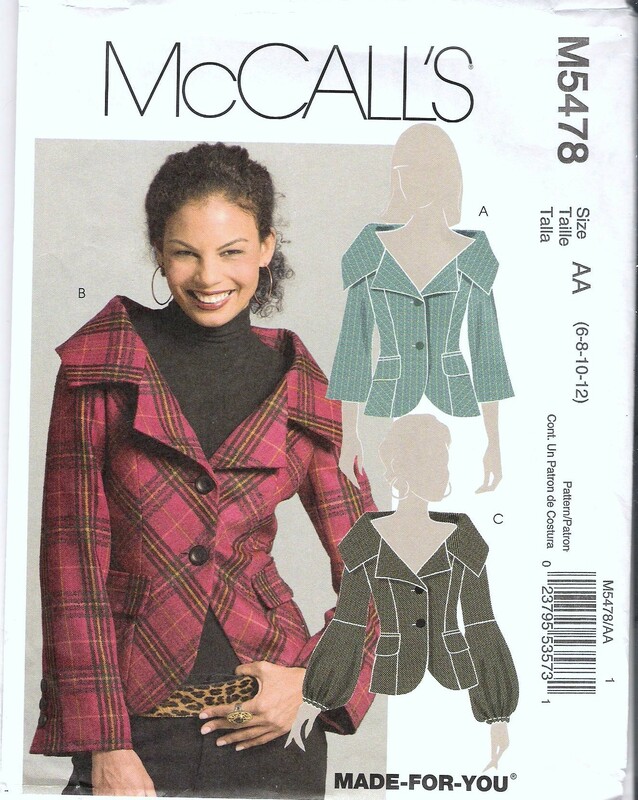 The next option in my lineup is McCall’s M5194. I was probably seduced by the sheen and texture of the velveteen in the pictures, even though it would be very, very unlikely that I would ever decide to make a jacket in velveteen. Also, I probably bought this planning on making the simple, solid version, shown here in chocolate brown without the binding detail all around the edges. However, as I drew it out, I realized it was that binding detail, drawing attention to curving lapels and vertical fronts, that attracts my eye, most. I might have to reconsider this…although that could be a pretty labor-intensive project, indeed, with velveteen bindings along all the edges! 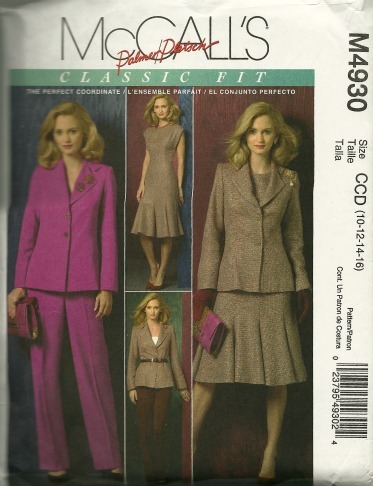 Also, I would make this one without the shoulder pads prescribed in the pattern. I’m not into that look, my shoulders are just fine as they are. 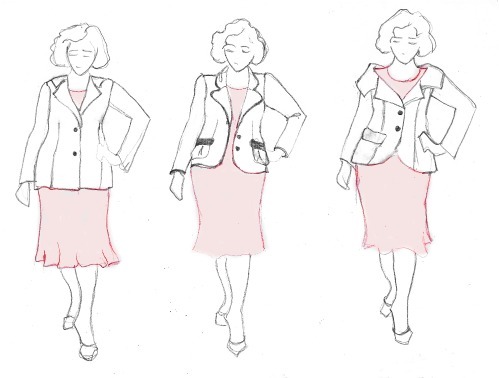 I worry a bit that I might have overemphasized the curves of this jacket’s design, in sketching–when I see other examples of this pattern, made up, online, they look more typical, straight-formed, more like my first jacket option, above. Also, this jacket was shown on its pattern cover only unbuttoned in the front, so I drew it that way, as well. It is unlike the others in that detail. But still, with the pleated pockets, the curved lower corners, and the shaped, 2-piece sleeves for a closer fit, this pattern might be worth an experimental muslin, just to see. And yet…I love it. I love the wide, offset shoulders. This is not the man’s suit jacket you picked up by accident, this blazer is a statement. A bit loud, as statements go, perhaps…but it has such interesting things to say! It’s kind of fun! I’d have to be careful about what I wore with it–nothing that would compete too sharply in either line, color or design. I’d leave off the faux pocket flaps, too, I don’t think it needs those. And I wouldn’t be doing it in a red plaid fabric, either…although it might be fun in a staid brown herringbone tweed, for example. Or a charcoal grey flannel with a bit of a stripe or texture to it. It’s a blazer with a wink and a nod built right in. I think it might just deserve an experimental muslin, as well. What do you think? Do you know of any other great, atypical blazer shapes that make the issue of a suit worth revisiting? This last blazer certainly screams “I have style” and would get compliments no matter what fabric you used. Plaid might be a real headache to match with all those points and curved seams. Ditching the pocket flaps is a good idea or make them narrower and slat them without a pocket underneath. If you were adventurous enough you could add hidden pockets in the princess seams and stitch the edges to the center front to hold them flat. They could be made of thin fabric or lining to reduce bulk. I like the B sleeves the best. Interesting concept of drawing the jackets on your own body’s sketch…it works well!